The footwear that makes you ask: who was I in 1996? We spent a significant period of time circa 1996 wearing homemade cut-off jorts with a cap-sleeved purple leotard, a brutal deep-plum lipstick, and a denim Blossom-style hat featuring a large synthetic flower front and center. Our passions included Grease 2, stray dogs, Hanson, and book fairs. We also enjoyed close readings of The Baby-Sitters Club series (which, for the record, in 2016 The New Yorker referred to as a “feminist legacy.”) However, of all of the things that we miss about the ’90s, the shoes…well, we’re glad they’re gone. It’s pretty safe to say that these shoes are making a comeback for a reason. Sometimes, it’s fun to get nostalgic about absolutely horrific footwear. Of course, taste is objective, so for a professional opinion we reached out to Los Angeles costume stylist Lisa Catalina. She founded Crazy Costume Lady, and she regularly works with actors who are looking to pull off a retro look—in other words, she’s got quite a few ’90s shoes in her closet, and she’s not afraid to give them an honest reassessment. At some point in your ’90s life, the Spice Girls were everything. Everyone had a favorite; maybe you were naturally more of a Baby Spice, feeling at your peak in white platform tennis shoes. Maybe you were more of a Scary Spice, in which case you asked your dad to pick up some laced leopard-print boots (he kindly declined). If you were more of a tomboy (or if you’d recently seen the Olsen twins masterpiece It Takes Two), you might channel Sporty Spice with an Adidas tracksuit and a pair of “trainers.” Granted, you weren’t actually training for anything, but nobody stopped you. In any case, you loved the Spice Girls, and you weren’t being ironic about the footwear. Barbie’s big, blonde head graced our feet for the better part of the ’90s. We’d love to tell you that we stopped wearing Barbie shoes when we hit 11, but to be honest, we were rocking pink Barbie kicks through most of middle school. For whatever it’s worth, Catalina says that she mostly missed this trend. Indeed. We all had roller skates, and they all had Barbie on them—at least in sticker form. In the ’90s, people liked to encase their feet in objects inspired by faraway times and places. For example, shoes like these Candie’s clogs look like they could have originated in the Netherlands sometime around the Middle Ages. In case you’re wondering, a clog from the Netherlands is called a “klomp,” plural “klompen.” Conveniently, “klomp” is also the perfect onomatopoeia for a shoe that resembles a block of wood. Klomp-clomp. We had no idea people still wore wooden shoes outside of the World Showcase at Epcot, but we’ll withhold judgment. Birkenstock clogs were also clogs, but they’re in a category of their own. Both boys and girls wore the occasional Birkenstock, but every ’90s clog was unequivocally ugly. Birkenstock clogs (just “Birks” for short) were colorless, shapeless, and, in an interesting turn for ’90s footwear, entirely without personality. They were basically baked potatoes. And we loved them. They were incredibly comfortable, unlike some of the entries on this list. Plus, they were an iconic symbol of the grunge movement. You don’t get much more ’90s than that. Catalina says that she’s not embarrassed by this trend. There you have it: If you’re looking for a Marxist shoe, pick up a pair of Birkenstock clogs. In 1995, Clueless taught us about rich Beverly Hill girls, high school parties, driving tests, and hooking up with our older ex-stepbrothers. We also learned some other stuff that Jane Austen wrote about. Of course, rather than consider the themes of “marriage and social status,” “the confined nature of women’s existence,” “the blinding power of imagination,” or “the obstacles to open expression,” we kept our eyes glued to the lower portion of the screen. We were mesmerized by chunky platform loafers paired expertly with killer plaid miniskirts and thigh-high socks. What about those sweet, shimmery Mary Janes? As Lauren Gelman notes in Reader’s Digest, the shoes were “a big about-face to the popular grunge styles of the time.” Plus, there were absolutely no stilettos. 1. You were actually a skater. 2. You were romantically interested in one of those skaters, but you didn’t really care to break all of your teeth out while attempting an olly. Kudos to anyone who actually pulled this look off. Yep, even when we were sliding down rails with our JNCOs and skate shoes, we were being total poseurs. In any case, skater shoes were horrifically uncomfortable. Maybe that was the point? 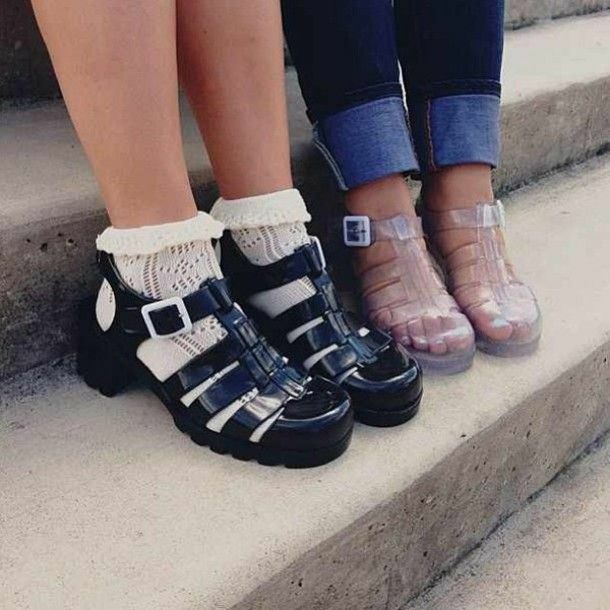 Was there anything more ’90s than jelly sandals? Looking at them today, it’s difficult to decide whether they were cute foot decor or alien life forms, but at least they were unique. We can’t imagine them any other way. Jellies were adventurous and unapologetically girly. They looked like jellyfish, and many manufacturers packed them with glitter. In short, they were shoes that would make Lisa Frank blush. Sometimes they had heels and you could wear frilly socks underneath them; sometimes they were transparent as a piece of crystal. They were truly magical shoes, and we wouldn’t be caught dead in them today. Catalina’s on our side for this one. We’re right there with you, sister. The ’90s was a dark time for sandals. You had your impossibly tall foam sandals, the MIA chunky sandals, double-strapped holographic chunky heeled sandals—whatever. Nobody cares now. These sandals are all a blur, they’re dead to us. Good riddance, sugar floaties. It’s time to close the chapter. Or is it? According to Catalina, ’90s footwear won’t stay down.